Lima (AFP) – Police clashed with independent miners in the Peruvian capital Wednesday, spraying them with tear gas and arresting 23 after marchers who want in to a government mining plan hurled stones. 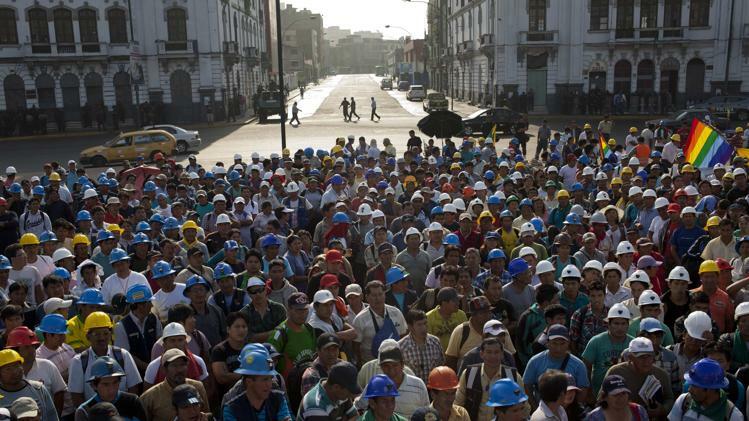 Peru, where mining is the biggest growth industry, has an estimated 70,000 informal or wildcat miners. They work for no company and, bucket and pick in hand, try their luck on their own. President Ollanta Humala’s government now wants to end “informal” mining, a practice that has been around for a long time. Miners without training are blamed for widespread use of toxic chemicals that pollute rivers people rely on for drinking water. While the government has cut deals seeking to increase training and help such miners find jobs, it has not done so with workers in the areas of Puno and Madre de Dios. So protestors marched on Congress in Lima. But police blocked the miners — who gathered near the Government Palace — from their target, arresting 20 men and three women.